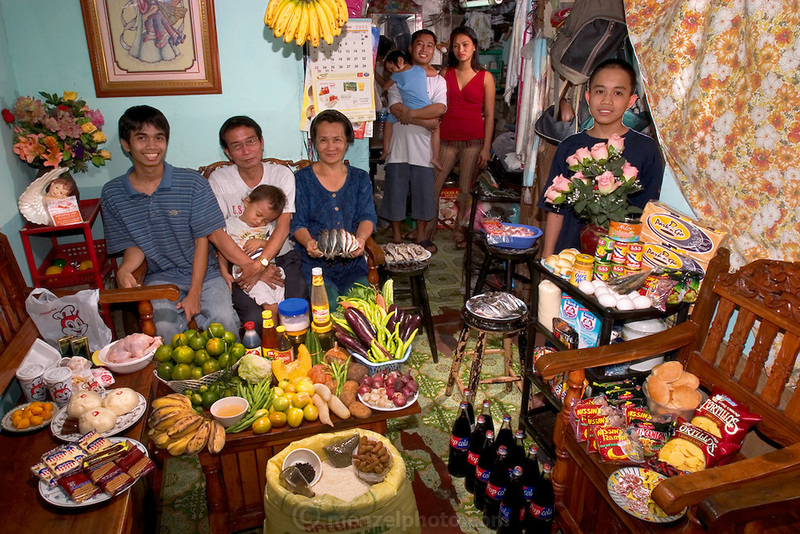 (MODEL RELEASED IMAGE) The Cabaña family in the main room of their 200-square-foot apartment in Manila, the Philippines, with a week's worth of food. Seated are Angelita Cabaña, 51, her husband, Eduardo Cabaña, 56 (holding sleeping grandson Dave, 2), and their son Charles, 20. Eduardo, Jr., 22 (called Nyok), his wife Abigail, 22, and their daughter Alexandra, 3, stand in the kitchen. Behind the flowers is the youngest son, Christian, 13 (called Ian). The Cabaña family is one of the thirty families featured in the book Hungry Planet: What the World Eats (p. 234).